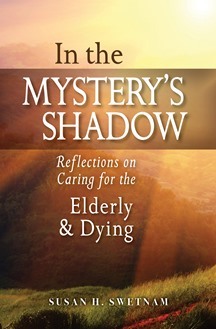 In her book In the Mystery's Shadow, Susan Swetnam draws on her experience serving thousands of ill and dying clients, often in hospice programs, as a certified massage therapist-and also on her experience of caring for her own husband, who died young of cancer. She explains how this sometimes difficult work offers not just the fulfillment of giving comfort to people who need it, but also moments of breathtaking wonder, moments that hint at the untold complexity of being human and affirm our sacred connections with each other. She writes of the hard lessons caregivers learn about themselves, while at the same time knowing the strange and humbling sense of being used in the service of God's love. Insightfully connecting end-of-life care with the liturgical year, Swetnam invites those who care for the sick and dying, whether professional or volunteer, to stay awake to the sacred implications of their labors. After three decades as an English professor at Idaho State University (during which she was honored as university distinguished teacher, researcher, and public servant), Susan Swetnam retired to a second-act career as a licensed massage therapist. She specializes in work with hospice patients, with the elderly, with cancer survivors, and with caregivers and the bereaved. She is the author of nine books and has published many articles and essays in national magazines (Gourmet, Mademoiselle), academic journals, regional magazines, and little/literary magazines. Widow of poet Ford Swetnam, she lives in southeastern Idaho, where she is a member of Holy Spirit Parish. Aging and dying are the two most important challenges we face in health care today. We have lots of cure, but we still have much to learn about care of those who are experiencing the debilitation of mature life and the prospect of death. Susan Swetnam has done a masterful job of weaving together art, music, literature, theology and personal experience as she shares the development of her own vocation as a massage therapist. Her stories of encountering and literally touching the aged and dying will help patients and providers embrace mortality and discover a new spiritual perspective.